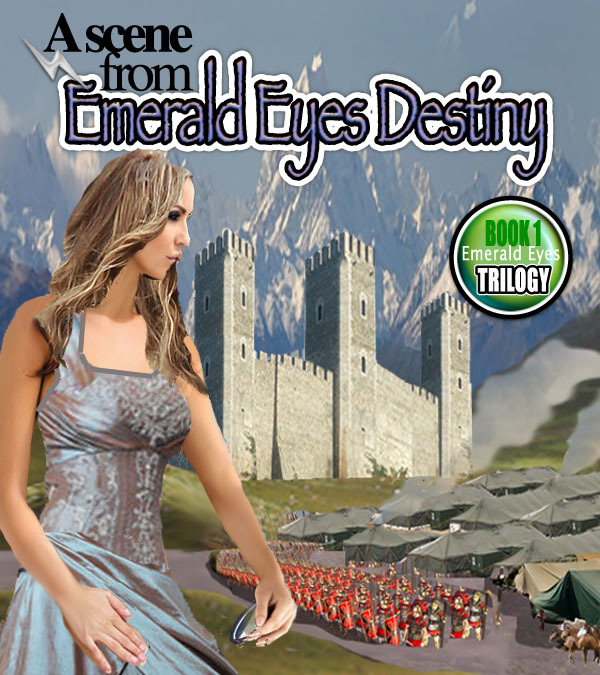 Emerald Eyes Destiny- Bk 1 in our trilogy. For three days Sylvia worked on the ancient spell without any success. Two of the ingredients seemed to be ancient potions unknown to her. Simon suggested they go back to the library and look through some more old reference books and she reluctantly agreed. She hadn’t used the receptor messenger at all, relying entirely on the methods described in the ancient spell recipe. What was needed was a trigger to set things in motion. She took the instrument out of an inner pocket of the long silver gown she was wearing and started a chant. For several seconds she continued the complicated spell until the section where it had always disintegrated before, was reached. At that point she switched on the receptor messenger to find the mirror had changed to black. Little silver lines flashed across it to form the words Sylvia spoke. Immediately the outer wall of her laboratory shimmered and a circular shaped hole appeared showing pine trees but little else. The air around her began to move. The warm air in the room was being sucked out into the colder outside climate. With a sudden swish, it increased intensity and Sylvia found herself being dragged towards the hole. She screamed and grabbed at the bench but the suction was too great. She felt herself skidding through the hole. Floorboards disappeared and she found her boots pushing against pine needles. She was on the other side! There was a faint whine, the wind stopped and the magic circle disappeared. With a pounding heart, Sylvia staggered to her feet and looked around. Behind her were the trees she had originally seen, but in the distance was a huge pentagonal shaped fortress stretching across the valley. Her feelings of relief turned to despair when she glanced around. Across the valley leading to Fortress of Frozen Stars were enemy troops, hundreds of them. It was the same view she had become used to from the fort except that she was now on the outside looking in. Two warriors poked Sylvia with their evil spears. “Move it witch, you heard the commander,” one said. She was forced along a corridor and down a windy stone stairway. For over a thousand years prisoners had stumbled along the stone corridor of the lower dungeon before being thrown into one of the numerous cells that lined each side. Ancient instruments of torture lay rusting and unused along the walls while rats darted along the floor and into holes where the ancient mortar had crumbled into dust. Oozy slime covered the walls and ceiling, and there was a constant drip of moisture that seeped through from the ground above. Sylvia attempted to walk with pride but injures received in her capture and rough handling by her captors caused her to stumble several times as she was prodded by the steel capped spears. However, the burly men were careful not to approach too closely. It was as if they were not convinced she couldn’t, with a snap of her fingers, cast lightning through the corridor and incinerate them both. Sylvia sighed and wished she could. Near the end of the corridor the head jailer drew a ring of keys from his belt and unlocked a massive iron door. “Inside.” He gave Sylvia such a shove she went sprawling forward to crash on her knees. “You stay there until you’re wanted, witch. One of the officers may wish to interview you later.” He smiled grimly, slammed and bolted the door. Sylvia stared around the filthy cell. Except for a small flickering oil lamp bolted to the wall, the only object in the room was a wooden bench chained to the wall. Dirty brown water dripped down one wall and green slime covered half the floor. The air was putrid with the stench of rotting vegetation interspersed with the more familiar smell of burning oil in the lamp. Now that nobody could see her, Sylvia allowed tears to stream down her cheeks as she sat on the bench. Her whole body ached, and blood from her cut arm dripped through her sleeve onto the floor.